Color Charts "A LA Carte"
Since 2001 Origin inc has been selling its classic tutorial "Adobe Photoshop for Textile Design". Since then we've had many requests to sell our color charts that are sold with our book ( the ones included on the disk ) separately. We were hesitant to do so but have been doing this unofficially for the past three years. Well it's time to make it official! If you want to purchase the color charts without the book you can now do so. When you purchase the color charts you are purchasing 36 pages of color charts. Each color chart follows the standard H, S, B (Hugh, Saturation and Brightness) values that are standard in the Adobe Photoshop color picker. Note: When you purchase these charts we will send them to you via e-mail (like an e-book). You will then print them out on your own printer. 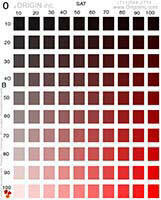 This is to ensure the accuracy of the colors you are matching. Note: After purchasing Color Charts "A La Carte" we will e-mail you a zip file that is 5,645 MB. Please make sure your e-mail provider can handle this. FYI most email programs can handle a minimum of 6,000 MB ( 6 Megabytes) which is plenty of space provided that your mail box is empty. Unzip the file that we sent to you called COLOR CHARTS. Take note as to which folder the files have unzipped to. The first step in using these color charts is to print them all out. You have to do this because the colors you have on the screen are not the same as the colors that you print out on your printer. The next thing you have to do is to double click the foreground color box (found near the bottom of your toolbox in Adobe Photoshop ). The Color picker menu will pop up. The H, S, B section on the Color Picker Menu corresponds to the H, S, B on the color chart. 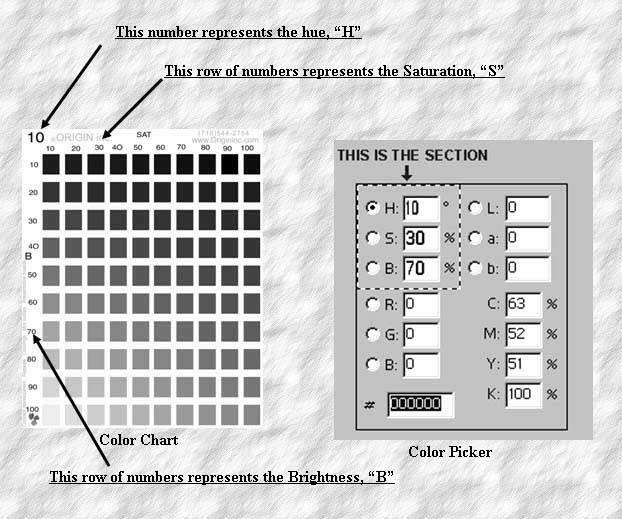 Fill the numbers next to H, S and B with the corresponding number from the chart. Look at the illustration below in order to get a better idea of what to do. Once it is printed out the color you just created in the color picker should now match the color on the color chart . Click the buy now button below to purchase Color Charts "A La Carte" for only $19.95 USD.